What happened to the animals when they left Noah’s Ark? They all went to Noah’s Park!. That’s right. Dreamer the rhinoceros, Honk the camel, Stretch the giraffe and five of their animal friends left Noah’s Ark and set off on a great journey to find a new home. After many perilous adventures the eight pals made their way through a brand new world until they came to a beautiful pond surrounded by a cozy cave, towering coconut trees, and a sparkling waterfall. When Ponder the frog saw Noah’s Ark setting on the mountain above them, he knew that they had found just the right place. They had journeyed from the ark to the park and found the ark waiting for them. They were home in Noah’s Park. 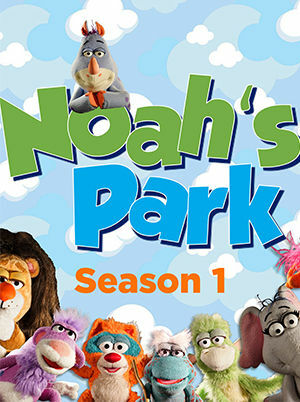 For more information, please visit noahspark.tv. Dreamer Has Another Nightmare - In his second nightmare Dreamer the rhinoceros finds himself trapped in Cozy Cave by a fierce snowstorm. Ponder helps him realize his best solution is to remember how God helped Noah overcome his fears. Life Value: Bravery and Trust.